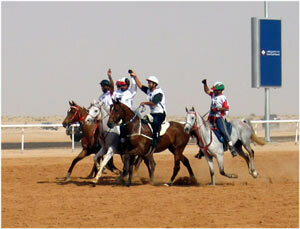 Dubai: A host of VIPs and royals participated in the FEI World Endurance Championship. General Shaikh Mohammad Bin Rashid Al Maktoum, Crown Prince of Dubai and Minister of Defence, led the way for the UAE with his three sons: Shaikh Hamdan, Shaikh Rashid and Shaikh Majid. Others taking part were Princess Haya Bint Al Hussain of Jordan, Shaikh Nasser Bin Hamad Al Khalifa and his brother Shaikh Khalid from Bahrain, Sultan Mizan Zailnal of Malaysia and Shaikh Mohammad Bin Hamad Bin Khalifa Al Thani from Qatar. France and New Zealand could not hide their disappointment after being channelled out of the competition yesterday. "It was disappointing to be out of the team title competition early during the ride," New Zealand team member, Mark Tylee told the Gulf News after his mount Jamahl went lame. Dubai: Shaikh Hazza Bin Sultan Bin Zayed Al Nahyan can be pleased with his late decision to switch horses, as it brought him a record-breaking performance. He was supposed to ride the leading Purebred Arabian endurance horse Shahdon, formerly ridden by two-time world champion Valerie Kanavy. Instead, he opted for Hachim, the horse he rode to victory in Bahrain. Sure enough, the 11-year-old bay gelding from the Wrsan Stables unleashed tremendous fighting spirit. 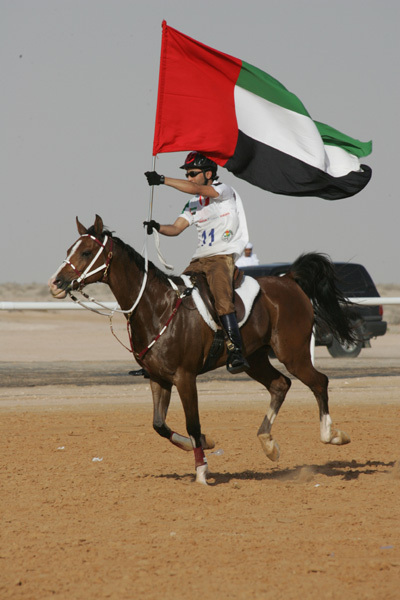 Dubai: Talk about surprises in sports and think of Italy... at least in endurance riding. With a strong line-up of teams like hosts UAE and the US along with former champions France and New Zealand, practically no one had the Italians booked as likely winners of the team gold at the end of a hard day in the desert. Shaikh Hazza Bin Sultan Bin Zayed Al Nahyan on Hachim registered the fastest time ever in a 160-km ride to become the World Endurance Champion at the Dubai International Endurance City yesterday. Italy emerged as the winners in the team championship. DUBAI: Shaikh Hazza bin Sultan Al Nahyan yesterday clinched the individual gold medal while Bahrain finished fifth in the team competition in the 160-km FEI Endurance World Championship at the Dubai Endurance City. 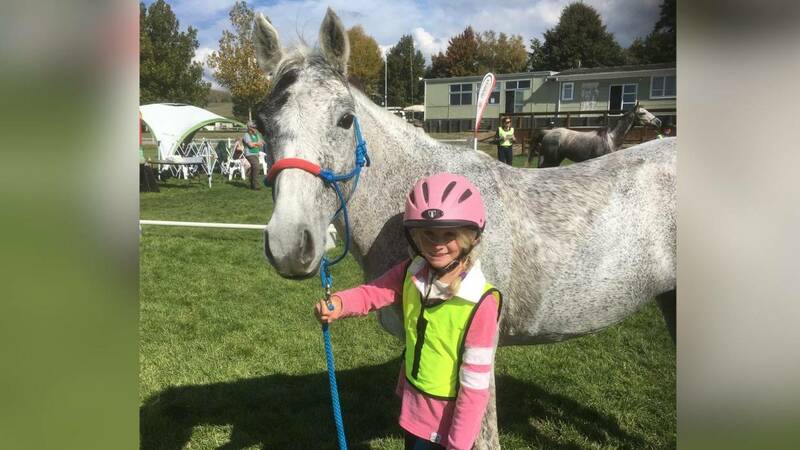 Riding the 10-year-old Bay Gelding Hachim and averaging 22.68 kmh, Shaikh Hazza pulled back a deficit of one minute and 35 seconds to clinch the sixth and final stage and complete the 160-km marathon ride in seven hours, three minutes and 22 seconds. Photo by Gilly Wheeler DUBAI ? Shaikh Hazza bin Sultan Al Nahyan won the world endurance championship crown for the UAE after a little-known French rider turned the world?s premier race into a Grand National steeple chase finish-like atmosphere here at the Dubai International Endurance City yesterday. Barbara Lissarague, 38, turned the heat on in the final 19 kilometres of the race to claim silver and prevent the Emirates from a medal sweep in the 10th FEI Endurance World Championship. General Shaikh Mohammed bin Rashid Al Maktoum, Crown Prince of Dubai and UAE Minister of Defence, took the bronze on Nashmi and Shaikh Hazza bin Zayed Al Nahyan finished fourth astride Mindari Aenzac. An exhausted but jubilant Australian team has taken out a silver medal in the toughest and longest horse race in the world, the World Endurance Championships. 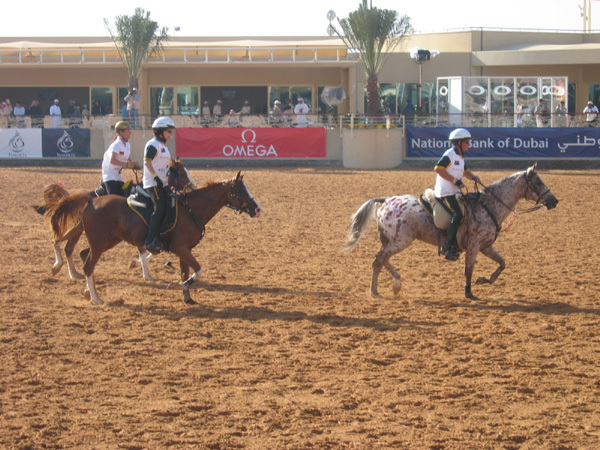 The Australian team was narrowly pipped by Italy in a field of 179 horse and rider combinations from 41 countries, competing in the United Arab Emirates (UAE). Only a few of the starters completed the gruelling nine and a half hour marathon across the desert, 70km from Dubai, which ended overnight. Few national teams survived to the finish with most - including New Zealand, Britain, Germany, and even hot favourite, France - disqualified by the half-way point. DUBAI ? With 183 horses representing 41 different nations, Dubai will stage the biggest equestrian endurance event in the sport?s history when the FEI Endurance World Championship gets under way today from the purpose-built Dubai Endurance City. The UAE will be hosting the event for the second time with sponsorship backing of Omega, Nakheel, the National Bank of Dubai and Nissan. The festivities began with an opening ceremony yesterday before the horses and riders take on the six-stage, 160km race across the UAE?s punishing desert terrain tomorrow. The finals will culminate in a closing ceremony, with an awards presentation on Saturday. Over the past few weeks, the horses have been arriving in the UAE to acclimatise for a championship that was last held in the emirates back in 1998 when 37 nations took part. This year, the UAE will compete with General Shaikh Mohammad bin Rashid Al Maktoum, Crown Prince of Dubai and the UAE Defence Minister, leading the way, while Shaikh Ahmad bin Mohammed Al Maktoum will be looking to retain the title he won at the 2002 World Endurance Championship at Jerez in Spain. Speaking to the international media gathered at the Endurance City, General Shaikh Mohammed said: ?This is a sport that is growing very fast and this week it is our pleasure to stage the biggest gathering ever in endurance history. All Arab horses come from the Arabian Peninsula and I am happy to welcome them home.? BAHRAIN's endurance horseride team continued their preparations for the World Championship which is scheduled for tomorrow starting at 5am Bahrain time at the Dubai Endurance City. A total of 183 horses from 48 countires are taking part in this one-day event, the biggest equestrian endurance event in the sport's history which will cover a distance of 160 kms. The Bahraini team is led by Bahrain Royal Equestrian and Endurance Federation (Breef) president Shaikh Nasser bin Hamad Al Khalifa of the Royal Endurance Team and includes Breef first vice-president Shaikh Khalid bin Hamad Al Khalifa of Al Khaldiya Stable, Shaikh Daij bin Salman Al Khalifa of Al Talia Stable, Shaikh Salman bin Saqer Al Khalifa of Ahmed Al Fateh Stable and Royal Endurance Team riders Hamad Al Meraisi and Yousef Taher. Dubai: Penny and her husband Peter Toft will be representing Australia, the 2000 team champions, in the World Endurance Championship here on January 27. But the Toft family has a larger role to play in guiding the fortunes of Australia, one of the stronger teams in world endurance. For this edition of the world championship, the Australians have devised a novel method of selection and are hoping it would fetch them team gold. Dubai: With the arrival of the final batch of horses from Bahrain and Oman, the field is now set for the FEI World Endurance Championship on Thursday. "We've have received one horse from Oman and another six from Bahrain and this completes the entire list of foreign horses," Mohammad Rashid Bin Ghadayer, Chairman of the Higher Organising Committee for the championship, told Gulf News. Dubai : One of the strongest assets of the current UAE national endurance team is the teenage presence. Out of the 12-member UAE team named for the World Endurance Championship , five are teenagers including the reigning world endurance champion Shaikh Ahmad Bin Mohammad Al Maktoum. Dubai : Riders from the US are here on a mission. After having dominated the first seven World Endurance Championships, they have drawn a blank in the last two editions. However, the six-member strong US team have arrived to take on the world, particularly hosts UAE. DUBAI ? 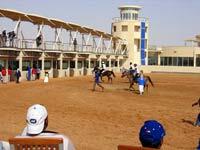 The 10th edition of the FEI World Endurance Championship will kick off with record field of 186 riders from 41 countries around the globe saddling their horses in the purpose-built state-of-the-art facility in the heart of the desert, off Dubai City on Thursday morning, it was announced yesterday. General Shaikh Mohammed bin Rashid Al Maktoum, Crown Prince of Dubai and UAE Minister of Defence will lead the 12-man squad which will carry the hopes of the host country in the international extravaganza. According to the organisers, it has not been yet decided who will be representing the country in the individual and teams competitions, and the issue will be worked out by the captain of the team General Shaiklh Mohammed and will be announced probably one day before the riders line up for the big test. THE Bahrain national endurance horseride team, led by Bahrain Royal Equestrian and Endurance Federation president Shaikh Nasser bin Hamad Al Khalifa, arrived in the UAE for the World Championship on Thursday starting at 5pm Bahrain time at the endurance village premises in Dubai. The six-member Bahraini team qualified for this event after completing three races over 160 kms last year. The team will be hoping for victory in this one-day event over a distance of 160 kms with 186 riders representing 48 countries in the fray. Shaikh Nasser qualified for the championship following his success at the Bahrain Endurance Championship, the New Market Race in the UK and Florac Race in France. The remaining riders are Breef first vice-president Shaikh Khalid bin Hamad Al Khalifa of the Royal Endurance Team, Shaikh Daij bin Salman bin Mubarak Al Khalifa of Al Talia Stable, Shaikh Salman bin Saqer Al Khalifa of Ahmed Al Fateh Stable and Royal Endurance Team's Hamad Al Maraisi and Yousef Taher. Team manager Shaikh Daij bin Salman Al Khalifa said a meeting will be held today for officials of the participating teams. The opening ceremony is also scheduled for today at 6pm Bahrain time while the riders' weigh-in will be held tomorrow at 7am Bahrain time. The course at the Dubai Endurance City will be laid out in a sequence of 6 stages. The competitors will, at the end of each stage, present to a standard "Gate to Hold" for a mandatory rest and evaluation period. The competition clock will stop for each entrant when they pass through the In Time gate in to the hold area. Riders must then present their equine for evaluation of metabolic and mechanical characteristics within 30 minutes. Following the presentation of the equine to the evaluations, the hold time begins. This time varies with each phase (gate), ranging from 30 minutes early in the competition, to 40 minutes in the later stages of the event. TWO Border endurance riders have arrived in Dubai in the United Arab Emirates and are making final preparations before they take on the worlds best at the World Endurance Riding Championships next week. Meg Wade, of Burrowye, and Kristie McGaffin, of Wodonga, are among a team of six Australians who will join riders from more than 40 other countries in the sports premier event. McGaffin will celebrate her 21st birthday on the day of the race on January 27 and her twin sister Naomi has also flown to Dubai as a member of the Australian crew. The riders and horses of the Senior World Endurance Championship British team are settling in well in Dubai after all but two flew out via Heathrow earlier this month, Beccy Broughton and Sarah Kellaway having been out there since late last year with their horses. The team are staying in the purpose-built Endurance City, at the Bab Al Shams Hotel, designed and built in just thirteen months and only recently opened. The City, like Athens, has hundreds of men working 24/7 to finish the complex before the Championships, which take place on Thursday 27 January. Rachael Claridge, Sarah Tyson, Katie Smith and Pam James stabled their horses overnight at the Chiltern Equine Clinic based in Chalfont St Giles, where the animals were examined by the team vet, Hugh Salmon, and equine osteopath Gavin Schofield, before going on to enjoy excellent hospitality at RAF Uxbridge the night before departure. All the horses travelled well during their seven hour flight, cared for by professional grooms supplied by Darley Transport. Since arriving, both horses and riders have been working on fitness and acclimatisation, power-walking some 10-15km twice a day through the desert with riders also going swimming and using the hotel gym. Daily temperatures are between 20-25 degrees (C) with a few spots of rain and a deceptively dehydrating cool wind, so everyone is drinking plenty of water. Team officials Jo Chisholm and Hugh Salmon have also been working on their fitness for the big day. The team riders have been able to experience vetting procedures under race ride conditions already as a 120km Nation Day Ride took place on Thursday (13 January). Sarah Kellaway had a young horse entered, ridden by Phil Hurst, and Beccy Broughton crewed for Anna Williams, daughter of FEI Head of Endurance & Reining, Ian. For more information on how the team are progressing in Dubai, visit the Endurance GB website: www.endurancegb.co.uk and click on "Jo's Diary". Fun In The Sun Endurance Festival (FITS) is slated for February 28 thru March 5 near Dunnellon, Florida. The ride will take place on the Goethe State Forest with the basecamp on private property next to the Goethe State Forest Headquarters at The Apex. FITS offers a wide array of rides for the endurance rider. Each day will have either a 50 or 55 mile endurance ride and a 25 or 35 mile limited distance ride. In addition, there are two 3-day Pioneer rides being offered. To top that off, we are hosting three 2-day 100 FEI CEI*** rides (the 2-day 100 rides are not AERC sanctioned). Additional sanctioning for each day will come from SERA and SEDRA. Riders coming to the Goethe State Forest to ride the Fun In The Sun Rides will be grateful to have such well-marked, scenic trails with nice footing. Basecamp is a large open field with primitive camping. It will open for the riders on February 24th. Festivities will kick off with a Welcoming Party hosted by Gulf Coast 4 Star Trailer Sales at the Black Prong Equestrian Center. Riders will enjoy a driving demonstration first at 3:30 pm and will end with a Bar-B-Q being served around 4:30 pm. The Kanavy Saddle Co is sponsoring the ride by offering a saddle to be raffled off to each day?s participants. That?s right, six saddles! Another sponsor is Southern States Feed who will be giving a horse nutrition talk on Thursday March 3rd along with a pizza party. Other sponsors include Equipads, Mobile Milling, Highermark, Animal Tacker, Tropical Rider, and Leather Therapy. The ride?s web site is up and running at www.fitsenduranceride.com . Riders will find entry forms, schedules, trail descriptions, local information, and links to the sponsors. DUBAI ? General Shaikh Mohammed bin Rashid Al Maktoum, Crown Prince of Dubai and UAE Minister of Defence, and Shaikh Mansour bin Zayed Al Nahyan, Minister of Presidential Affairs, created a history of sorts when they were declared joint winners of the National Day Cup here at the Dubai Endurance City yesterday. General Shaikh Mohammed and Shaikh Mansour crossed the finish line together in a bunch of six horses, covering the FEI-CEI Three Star 120km trip in five hours 20 minutes and 29 seconds. The National Day Cup staged for the first time outside Abu Dhabi was deemed as a dress rehearsal for the Dubai FEI Endurance World Championship at the same venue on January 27. 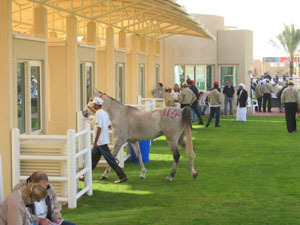 The First Gulf Bank-sponsored race showcased the new state-of-the art facilities to the foreign riders, crew and officials already in the endurance village for the world event that returns to Dubai after the 1998 edition held for the first time outside Europe and the United States. Shaikh Mohammed astride 11-year-old Arabian gelding Al Naa?is and Shaikh Mansour onboard the rangy eight-year-old bay Ro Saad, crossed the finish line in one of the now familiar hands-held gesture in a bunch of six that included Abdulla Khamis Ali Saeed, Yousef Ahmed Al Bloushi, Hassan Abdulla Al Hammadi and Ahmed Jassim Al Hammadi. Shaikh Mansour said the race was an excellent launch pad for the host team. ?It was a fast run race and it showcased the readiness of the UAE team?s title defence. We are thinking positively at the world championship and I feel the UAE team will be the one that all have to beat come January 27.? 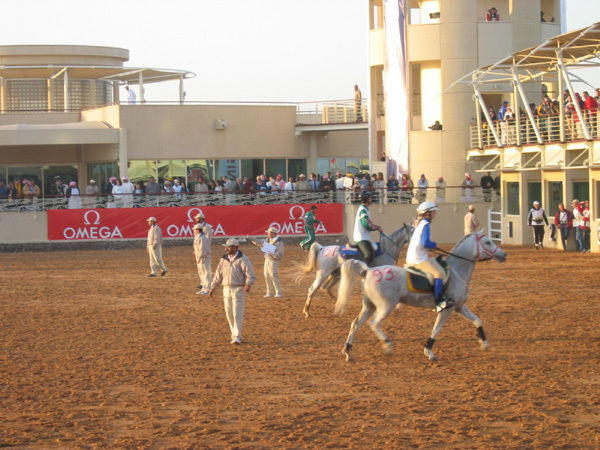 Shaikh Mansour remained in the leading group and was third into the final loop behind Al Reef Stables lead rider Abdulla Khamis Ali Saeed on 12-year-old Arabian gelding Shiranna Bokhara and his stable mate Yousef Ahmed Al Bloushi astride a former flat race horse 11-year-old El Hadzin Deleyre. Both Shaikh Mohammed and Shaikh Mansour are in the 12-member UAE?s World Championship team. Sultan Ahmed Sultan bin Sulayem finished 13th on nine-year-old Irex du Mas whilst two more members of the UAE squad, Shaikh Hazza bin Sultan Al Nahyan and his younger brother Shaikh Khalid, took 19th and 20th spots respectively. Shaikh Hazza bin Zayed Al Nahyan, Shaikh Rashid bin Mohammed Al Maktoum and his brothers Shaikh Hamdan, reigning world champion Shaikh Ahmed and Shaikh Majed, Shaikh Rashid bin Hamdan Al Maktoum and Ali Al Muhairi, either retired or were eliminated. The race drew 120 entries and was run over five loops. Shaikh Mansour remained in the leading group throughout the race after coming in second behind Mubarak Khalifa bin Shafya in the opening loop. Shaikh Mohammed worked his way up from 40th place to go into the final loop in fourth with over eight minutes behind the leader Abdulla Khamis. Shaikh Mansour was third behind Yousef Ahmed in the final loop. A SIX-MEMBER Bahraini endurance horseride team is taking parting part in the seniors race at the World Endurance Horseride Championship in Dubai on January 27. Bahrain Royal Equestrian and Endurance Federation (Breef) president and team captain Shaikh Nasser bin Hamad Al Khalifa will lead the team in the day-long event which will cover a distance of 160 kms. Breef national teams manager Shaikh Daij bin Salman Al Khalifa, who is also taking part in the race, said Shaikh Nasser approved the list of riders for this event. The remaining four riders of the team are Breef first vice-president Shaikh Khalid bin Hamad Al Khalifa of Al Khaldiya Stable, Shaikh Salman bin Saqer Al Khalifa of Ahmed Al Fateh Stable, Hamad Al Meraisi and Yousef Taher - both of the Royal Endurance Team. Shaikh Daij added the Bahraini riders will be taking part in both the individual and teams races along with world class veteran riders. The six Bahraini riders qualified for the World Championship after successfully completing three races over similar distance, including events held earlier this year in Europe, Australia, Africa and Bahrain. Ovando rancher Suzanne Hayes and her horse Quincy have had to withdraw from the United States equestrian team preparing for the World Endurance Championship race in Dubai of the United Arab Emirates on Jan. 27. Hayes and Quincy, whose official name is Tezero's Gold, went into training with the U.S. team in Florida ranked among the squad's top six horse/rider teams that qualify for the world championships. But Quincy had developed some lameness while training there. "As I suspected some weeks ago, around the first of January," Hayes wrote Wednesday in an e-mail to the Missoulian, "Quincy was just not improving to the point that I was happy and comfortable with, so I withdrew him from the traveling team consideration. This horse was an amazing animal, and while he had worked his way to very near the top of all the horses selected, I did not want to take up a spot on the USA team, and not feel that we could contribute in a big way." It was an extremely emotional decision for her and the team, Hayes said. "Every single member of the USA team and staff had tears in their eyes and disappointment on their faces," she said. But Hayes' hard work and perseverance paid off when the team members named her team captain during the world championships. DUBAI - General Shaikh Mohammed bin Rashid Al Maktoum, Crown Prince of Dubai and UAE Defence Minister, will lead a formidable team of riders that will represent UAE at the World Endurance Championship, which will be held here on January 27. No horse names accompanied the announcement. The four teams and two individuals who will represent the United States in the World Endurance Championship will be named just prior to the start of the ride. The other three horse and rider combinations will compete in the President?s Cup next month. The remaining national team members will travel to the UAE with the squad and will act as support crew for their teammates during the ride. For more information, please contact Sarah Lane, Public Relations Manger, by phone at (859) 225-6974, or via e-mail at slane@usef.org. USEF press releases are available on our website, www.usef.org. A record number of 185 riders from 44 nations have announced their participation at the FEI World Endurance Championship, to be held on 27 January 2005 in Dubai. The Definite Entries List will be available from the FEI website endurance section by the end of the week (section what's up). DUBAI - General Shaikh Mohammed bin Rashid Al Maktoum, Crown Prince of Dubai and UAE Defence Minister, will lead a formidable field of riders in the Federation Equestre Internationale World Endurance Championships to be held at the Dubai Endurance Village from January 26-29. The event forms part of the Dubai Shopping Festival 2005 calendar of events. With a record number of horses from 41 nations participating this year, the UAE will be hosting the event for the second time. The ride, which is a sure test of strength and stamina through long and ardous terrain, is hopefully to be added as a discipline to the Olympic Games. The horses were all due to start arriving in Dubai from yesterday allowing them time to acclimatize ahead of the competition. The first endurance event, which was held in 1998 with participants from 37 countries, was shaped into a mega racing affair thanks to the keen initiative and directives of the late president, Shaikh Zayed bin Sultan Al Nahyan who was behind the development of the sport in the country. Subsequently the event went on to be recorded as the biggest of its kind in the Guinness Book of Records. With the championship planned to be one of the highest international standards and approved by FEI, the UAE office of Emirates International Endurance Racing (EIER), is sparing no efforts in organising this mammoth event. As all preparations are done under the supervision of General Shaikh Mohammed bin Rashid, the event acts as another harbinger of world-class sports and business in the UAE. Shaikh Ahmed bin Mohammed Al Maktoum is the current holder of the World Endurance Champion title he won in 2002 in Spain. Each participating country can enter a team of four or three in the teams competition and can also compete as individuals. The Dubai Endurance Village, the Organising Committee and the FEI now look forward to welcoming the expected 800 riders, crew members, team vets, team doctors, horse owners and officials who will participte in what is likely to be the biggest Equestrian World Championship ever. The Dubai Shopping Festival 2005 runs between January 12 and February 12.
section by the end of the week (section what's up). It may be ?off-season? in Great Britain but for some endurance riders it?s all go in the lead up to three major championships in 2005.